Recognizing your spending habits is important. Once your figure out the type of spender you are, it’s easier to adjust your budget accordingly. Michele Cagan, CPA, author of BUDGETING 101, shares her four categories of money personalities. Your budget really starts with you: the way you handle money now and whether you’d like to change your relationship with money. If you know your money personality, you can frame your budget accordingly. Emotional spenders buy more when they’re angry, sad, or happy, and that can lead to impulse purchases and credit card debt that derails other budget goals. Creating spending blockades can help slow things down when the urge to shop strikes. Adding a special savings account to cover occasional overspending will help prevent excessive credit card debt. Status spenders live large, buying big-ticket items and keeping up with the latest everything. They’re comfortable with risk (including risky investing) and debt, which can lead to budget breakdowns. By budgeting for those big purchases and occasional losses, they can smooth out financial ups and downs and avoid running up unmanageable debt. Dodgers avoid money stress by hiding from it (such as ignoring bills they can’t pay). They don’t think about or plan for the financial future so are often significantly behind on savings goals. Automating budget features (such as bill paying, expense tracking, and saving) reduces that stress and helps make sure nothing gets skipped. Mega savers tend to be future focused and risk averse, prioritizing financial security over everything else. They avoid debt and invest ultra-conservatively, but those choices can also take a financial toll in the forms of low credit score and savings that don’t keep up with inflation. The budget can address this by adding back these riskier categories in a secure way. No matter which money personality best fits your situation, your budget can bring better financial balance and reduce financial stress. Find out how to tracking your expenses, get out of debt, and budget in BUDGETING 101 by Michele Cagan, CPA. Excerpted from Budgeting 101 by Michele Cagan, CPA. Copyright © 2018 by author. Used by permission of the publisher. All rights reserved. Don’t break the bank—learn to create and stick to a budget with this comprehensive, easy-to-understand guide to saving money sensibly in this edition of the popular 101 series. Sometimes, it can seem like saving money is impossible. With everyday expenses, from groceries and gas, to the electric bill and lunch money, as well as those unexpected expenses, like car repairs and medical bills, getting—and keeping—control of your finances can feel overwhelming. With Budgeting 101, you can start saving now. This clear and simple guide provides tons of practical advice for keeping track of your finances. 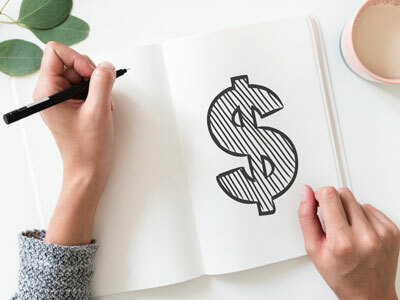 With useful tips on setting financial goals, reducing debt, finding ways to save money, and creating and following a budget plan, you’ll have your dollars and cents under control in no time. Why spend more of your hard-earned money on a financial advisor? 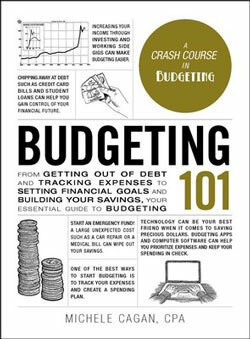 Filled with expert advice on a wide range of the most common financial concerns and step-by-step instructions to managing your money both now and in the future, Budgeting 101 has you covered.